IBM Mobile Foundation provides a Java library to enforce security capabilities on external resources. The Java library is provided as a JAR file (mfp-java-token-validator-8.0.0.jar). This tutorial shows how to protect a simple Java Servlet, GetBalance, by using a scope (accessRestricted). Read the Using the MobileFirst Server to authenticate external resources tutorial. Understanding of the MobileFirst Foundation security framework. To be able to validate tokens, instantiate TokenValidationManager. authorizationURI: the URI of the Authorization server, usually the MobileFirst Server. For example http://localhost:9080/mfp/api. clientId: The confidential client ID that you configured in the MobileFirst Operations Console. clientSecret: The confidential client secret that you configured in the MobileFirst Operations Console. The library exposes an API that encapsulates and simplifies the interaction with the authorization server’s introspection endpoint. 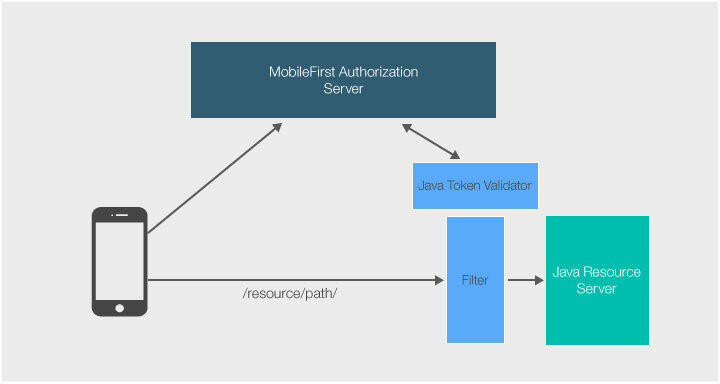 For a detailed API reference, see the MobileFirst Java Token Validator API reference. authorizationHeader: The content of the Authorization HTTP header, which is the access token. For example, it could be obtained from an HttpServletRequest (httpServletRequest.getHeader("Authorization")). expectedScope: The scope to validate the token against, for example accessRestricted. The TokenValidationManager class comes with an internal cache which caches tokens and introspection data. The purpose of the cache is to reduce the amount of token introspections done against the Authorization Server, if a request is made with the same header. The default cache size is 50000 items. After this capacity is reached, the oldest token is removed. You can deploy the project on the supported application servers (Tomcat, WebSphere Application Server full profile, and WebSphere Application Server Liberty profile). Download the simple Java servlet. Make sure to update the confidential client and secret values in the MobileFirst Operations Console. Deploy either of the security checks: UserLogin or PinCodeAttempts. Map the accessRestricted scope to the security check. Update the client application to make the WLResourceRequest to your servlet URL.